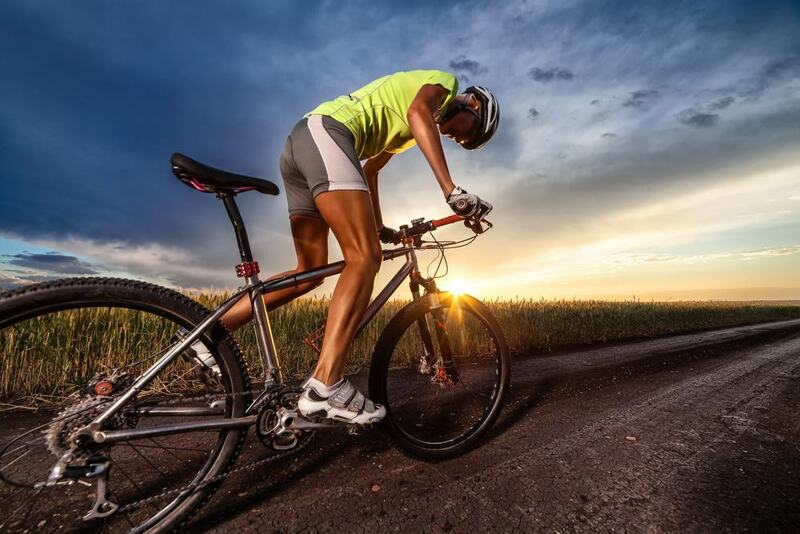 As you begin your cycling journey, the first thing you need is a road bike. Being a beginner, you need not spend a lot of money on your ride, but of course, you only want the best starter road bike that you can afford. Luckily, I’ve prepared a detailed review of the best starter road bikes, plus a few other vital factors to consider in your search for your road bike buddy. 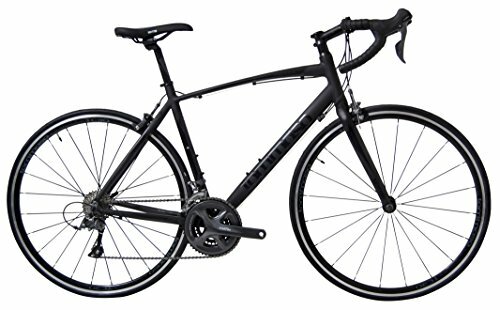 What to Look for in a Starter Road Bikes Under the $500 to $700 Mark? Aluminum is a standard frame material because it is corrosion resistant, lightweight, and affordable. It has a high strength-to-weight ratio. Most beginners prefer this material, especially if they are on a tight budget. Aluminum frames are excellent because the bike can accelerate quickly. They offer snappy handling as well. However, aluminum is stiff, which means that you can have a harsh ride quality. Unlike the other frame materials, it can become uncomfortable riding an aluminum frame bike, especially for long distances. An aluminum frame is best for starter road and mountain bikes. Carbon Fiber frames are best for high-end road and mountain bikes because they are lighter than titanium, steel, or aluminum. Since they have a lower density than the others, they are perfect for absorbing road vibrations that result in comfortable rides. Bike manufacturers can have creative designs with this kind of bike frame, especially if they want to maximize its aerodynamic efficiency. They can vary the alignment of the fibers in different areas of the bike. Carbon fiber also resists corrosion better than metal. However, it is also the most expensive material for bike frames. Furthermore, structures made from carbon filter are more susceptible to fracture than metal. A fractured bike frame becomes unfit for use. Titanium bike frames have similarities with steel. Both of them offer better resistance to fatigue and corrosion. Both are lightweight and long-lasting. Thus, most manufacturers of titanium bike frames provide lifetime warranties. If you have a titanium bike frame, you can have a smooth ride quality that equals that of carbon fiber. Titanium can absorb road vibrations and is snappier than steel. Thus, performance bikers prefer a titanium frame. Moreover, because it is noncorrosive, it does not require paint. However, it is a rare material and labor intensive. If ever you find a titanium bike frame, you can expect it to be costly. Steel was the favorite material in previous decades. However, because of aluminum and carbon fiber, it has taken a back seat primarily because it is massive and costly. High-end bikes do not use steel frames because of their weight. On the other hand, low-end models do not use steel frames because they are more expensive than others. However, steel is famous for custom bike builders because it offers a smooth ride quality, especially for long distances. It is stronger and denser than aluminum, and less expensive and easier to work with than carbon fiber. It is also very robust and fatigue resistant. If the frame has fractured, it is easy to repair. Nowadays, people buy their bikes online because it is convenient to do so. However, if you will order online, you need to know the bike size that will fit you. Fortunately, there are various ways of selecting the right bike size. Leg Inseam Method Stand barefoot with your legs apart by 15 to 20 centimeters. Then, you need to measure the height between the ground and your crotch. 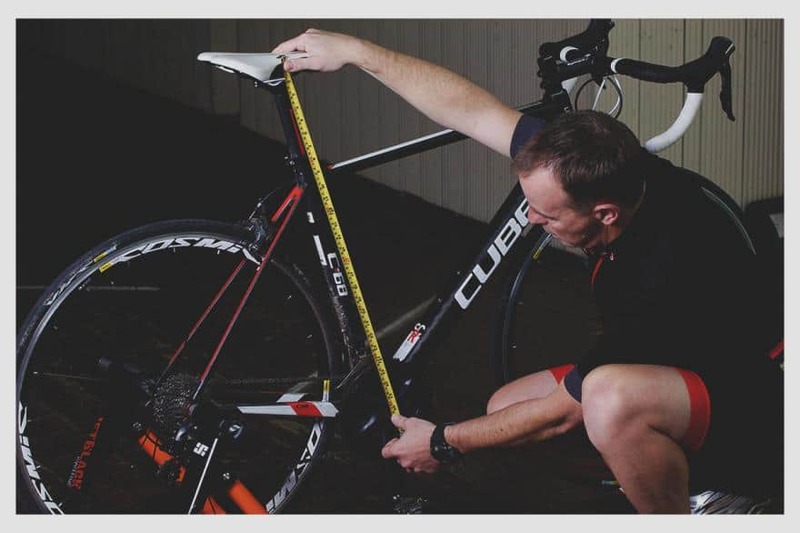 If you want to buy a road bike, you need to follow this simple formula: Road Bike Frame Size = Leg inseam in centimeters x 0.70 For instance, if your leg inseam (height between your crotch and ground) is 76 cm, then your road bike frame size is 53 cm. However, for high-performance biking, disc brakes, which can be either hydraulic or mechanical, are preferable. Drivetrain The chain of the bike runs from center’s crankset to the rear cassette found at the rear hub. Often, cranksets have two or three chainrings. You can shift to any of the chainrings through coarse gearing adjustments. On the other hand, moving between sprockets at the rear cassette requires fine gearing adjustments. To compute the bike speeds, you need to multiply the number of chainrings by the number of sprockets found in the rear cassette. For instance, a bike with 27 speeds means that it has three front chainrings and nine sprockets in its rear cassette. In general, a bike with more gears than the others have more flexibility in different grades. Handle Bars A high-rise handlebar allows you to sit in an upright position. On the other hand, a bike with drop bars will enable you to sit in a fully bent seat. You can improve your riding position by swapping handlebars and stems. Since different riders prefer different handlebars, you need to know the kind of handlebar that you want. You can always buy a replacement handlebar if you do not like the original that comes with your bike. Saddle The choice of the saddle depends on the rider’s preference. 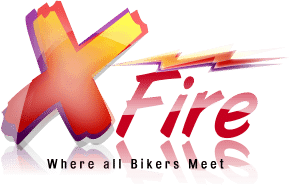 Some riders may prefer the narrow and firm type, while the other bikers may prefer the full and soft saddle. You may want a suspension seat post or a rigidly mounted type. Just like the handlebar, you can purchase the kind of seat that you want for your starter road bike. The narrow and firm saddle for road bikes offers more control than the broad and soft type. It allows you to pedal and change your position more efficiently. Shifters A road bike has two derailleurs: the front and the back. The front derailleur brings the chain in between the crankset’s sprockets. On the other hand, the rear derailleur moves the chainring in between the rear cassette’s sprockets. A shifter controls a derailleur. You can find the twist shifters on the handlebars. If you want to change gears, you twist the shifters. On the other hand, the trigger shifters have two levers: one for upshifting and another for downshifting. These shifters click whenever you shift gears. Therefore, you easily know where the next gear is. A chainset is a component of the road bike’s drivetrain. 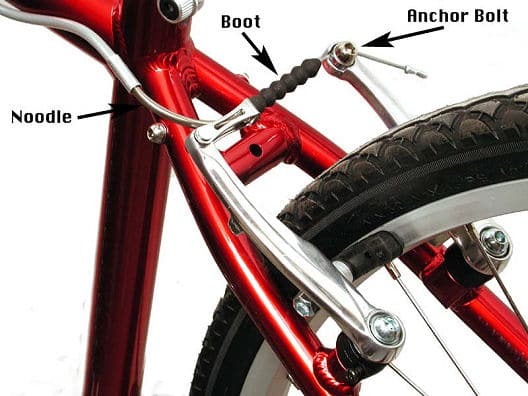 It connects through the belt or chain to the bike’s drive wheel. The bottom bracket supports and houses the chainset as it rotates. 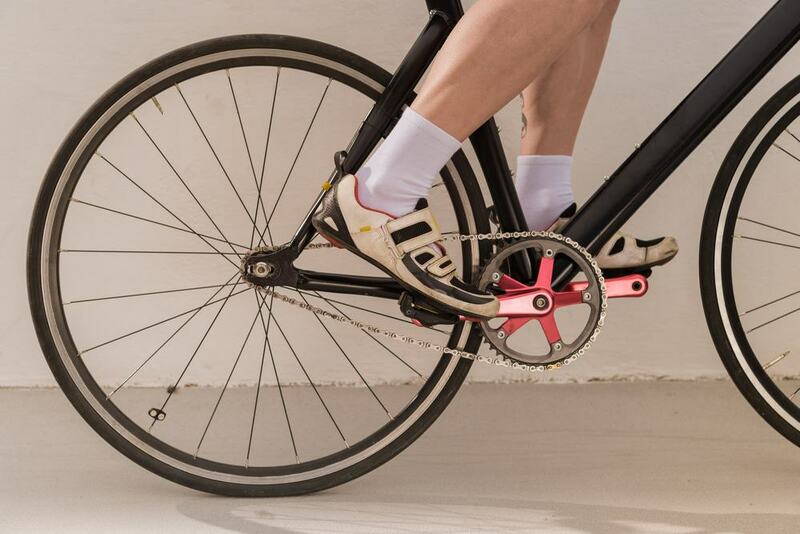 The clockwise movement of the chainset propels the bike to move forward. The crank is equivalent to a car’s accelerator pedal or a boat’s throttle. If you want to turn the bike’s wheels, you must set the cranks. A chainset must withstand the stresses and motions of cycling, so it must be robust. Manufacturers prefer carbon and aluminum alloys for the crank arms. If you want to upgrade the chainsets, but want to maintain the size of the chainrings, you must look for the marking on your existing chainset. The chainrings will have a stamp on how many teeth each rig has. You can also count them. You can find the crank length inside of each crank. It is near the pedal’s threaded hole. The road bike’s chainsets can range from 165 mm to 180 mm. You must select the appropriate chainset for your bike’s frame. If you are in doubt, you can consult a road bike enthusiast or professional. Clincher A clincher tire is a standard. It holds in different inner tubes. Road bikes use this tire type. Tubeless A tubeless tire is perfect for mountain biking, although some road bikers prefer it as well. It has an airtight clincher structure without the inner tube. Unlike the clincher tires, the tubeless wheels have backward rims. Tubular A tubular tire is uncommon because it is difficult to assemble. Similar to a clincher tire, it has tubes. However, the tubes are in an enclosed casing and glued to the rim. Professional racers prefer tubular tires. If you want to replace a wheel, you need to know the clincher’s features. Durability Clincher tires are durable and usable in different weather conditions. Aerodynamics Manufacturers of clincher tires are serious about the aerodynamic effects. When a tire has excellent aerodynamics, you will experience a smooth ride even if you are on the heavy side or even in the presence of strong winds. Lightness A clincher tire is agile and light. You get a feeling of flying whenever you use it. Good friction Some manufacturers use the UB technology because it produces more stable brake friction whenever you make a stop in any weather condition. You will find a clincher tire easy to repair or adjust. You do not need fancy tools. Even if your road bike has the conventional side-pull rim brakes, you can replace them with disc brakes, which are common on mountain bikes. A disc brake utilizes a metal rotor on the hub of the wheel with a fixed caliper that compresses the rotor. It can be either a hydraulic or a mechanical disc brake. A mechanical disc brake has a lever like a rim brake. You release the cable’s tension through the gear to compress the rotor’s pads. On the other hand, a hydraulic disc brake has a brake fluid inside the lever body. The fluid moves through the caliper through a hydraulic line to compress the rotor’s pads powerfully. A disc brake provides substantial stopping power even during the wet weather. You get outstanding modulation precision between light and powerful brakes. A disc brake is also efficient because it requires reduced pulling force when applying the brakes. It does not heat the rim even on long descents. However, a hydraulic disc brake is difficult to maintain. 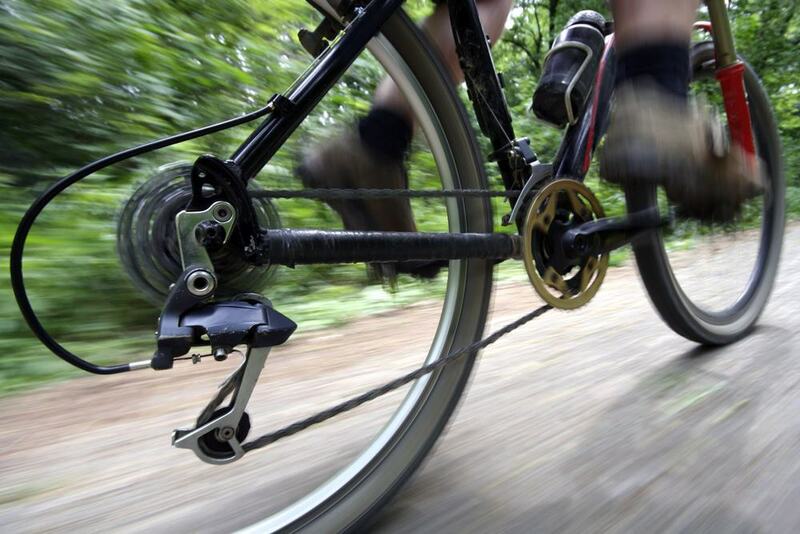 Both types of disc brakes add weight to the bike because they use the extra equipment. Road bikes use clipless pedals with a 3-hole design. These pedals have larger plastic cleats, which protrude from the sole of your shoe. The 3-hole design spreads the force over a wide area and reduces the pressure for a secure connection during pedaling. These pedals give you ultimate control as you ride your bike. It keeps your feet in place even when you ride through bumps or apply power. However, you need practice in getting in and out of these pedals, especially if you’re a beginner. 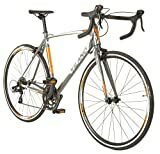 Now that I’ve gone through the basics of what you should consider when looking for a road bike. 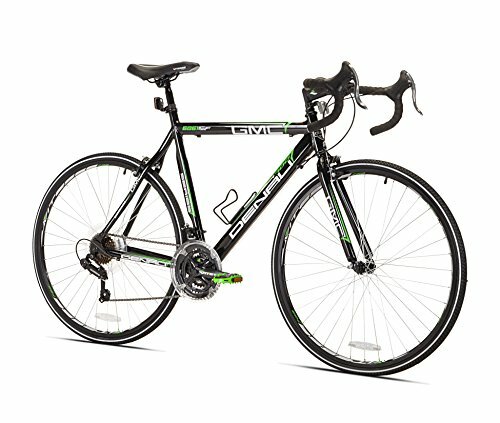 here’s what I think is the best starter road bike regarding feature and performance. 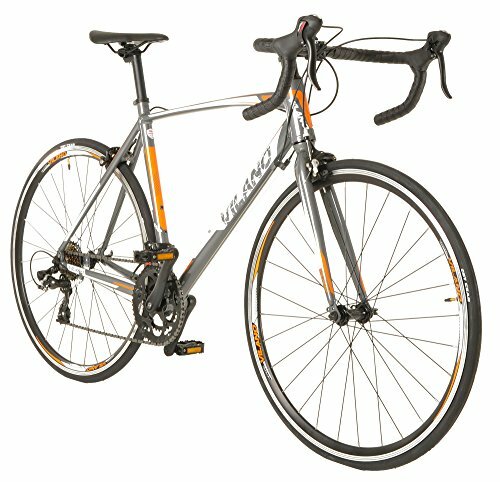 The Giordano Libero 1.6 is a beautiful bike designed for durability and convenience at an affordable price. I was able to use this as my first road bike. The Libero 1.6 is perfect for climbing because of its lightweight 6061 frame and 700cc wheels made from aluminum. It is stable to ensure safety, and its aluminum frame is solid. Its handlebars are robust to carry my weight with ease. They come with soft padding to protect my hand as I ride on uneven roads. I find the frame extremely stable. It has a smooth feel. The frame weighs about 25lbs, but you can replace some parts if you want a lighter one. The drivetrain has a Prowheel crank, and the cassette, front and rear derailleurs are from Shimano. 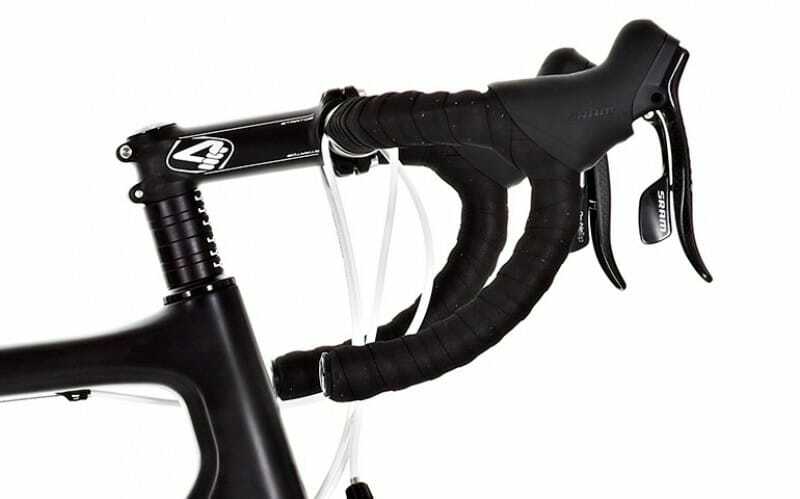 This bike integrates Shimano shifters into the brake levers. As such, you get a decent shift quality. The 32-spoke alloy rims of the wheelset are from Vitesse. Thus, the wheels get a lot of stability and support to prevent any unexpected bending from impact and weight. If you are a beginner, you will appreciate the extra width provided by Kenda 700c x 25c tires. 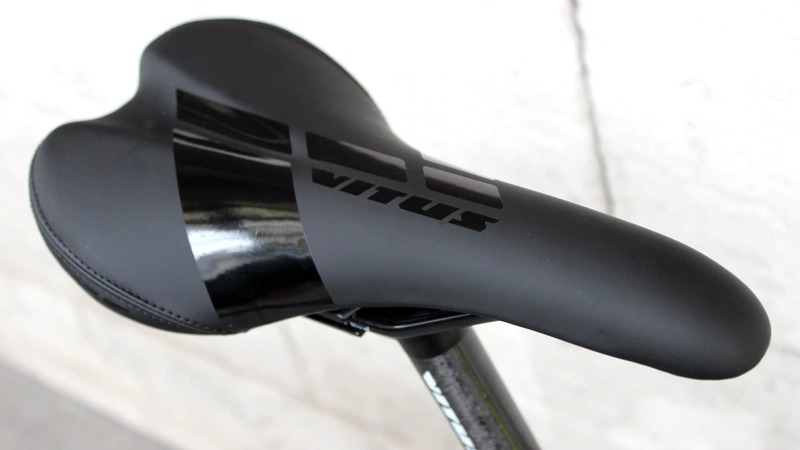 The Velo saddle is adjustable and has a good fit and decent cushioning. The metal-spiked pedal is better than the usual cheap plastic found on inexpensive bikes. Moreover, it has two mounts for the water bottle. Thanks to its affordable price, the Giordano Libero 1.6 offers decent features. However, I was able to improve it with a little more money. First, I found the seat uncomfortable, so I replaced it. The breaks and shifters are excellent, although some expensive bikes offer better alternatives than what this bike offers. Also, if you are buying this bike, you may need to bring it to a bike shop for a quick tune-up. The derailleurs are a bit off. Also, since this bike is inexpensive, you may need to upgrade its bottom-of-the-line tires. You surely do not want to find yourself stranded with a flat tire. 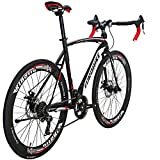 The Giordano Libero 1.6 Men’s Road Bike 700cc is affordable and dependable. I found it easy to assemble and use it for fitness and transport because it is lightweight. However, it is not for severe training and roadwork. You must ensure that the screws and bolts are tight before you use it. Also, the breaks are not very responsive at maximum speed. Fortunately, if you find minor issues, you can upgrade some parts at affordable costs. Buying this bike is still better than purchasing the more expensive ones if you are still a beginner. The 16 overall speeds will provide some additional alternatives for climbs. They can also offer a comfortable cruising speed. The Tommaso Imola is one of the best road bikes under $500. It is lightweight with excellent shifting gears. It is perfect for the terrain of any consistency or steepness. The aluminum frame is very lightweight, so I can go as fast as I can because it keeps resistance and friction off the ground. An extra steel frame reinforces it to add strength against the wind. The curled under handlebars reduce wind resistance because my back is lower than usual. As such, they allow me to increase my overall speed. The wheels are compact and very narrow to lessen wind resistance and friction on the ground. I do not experience any problem whenever I use this bike for long distances at top speeds. The crankset is a Shimano Claris, and it is the best one in the market today. With it, you can pedal on flat terrain comfortably and climb steep hills at 24 speeds. The bike is perfect for beginners. Also, the bike uses Shimano Claris shifters. Thus, I find it effortless and seamless to shift gears without using my hands. Furthermore, the Tommaso Imola has Shimano Claris brakes, one of the premier brakes available in the market. I have safe and clean stops every time I slow down. I find the tires uneven, defective, and wobbly, so I bought new ones to ensure efficient and smooth rides. I assembled the bike, but it does not come with an instruction manual. So, if you have no experience in building a bike, you may need to bring it to a bike shop. I also did not like the pedals, so I replaced them quickly. The steel fork is more massive than its aluminum counterpart. As such, it adds weight to the Imasola bike. However, this bike will do for a beginner because the steel fork will not have a significant impact on your overall ride. The Tommaso Imola Endurance road bike is perfect for starters. However, you may need to replace the tires because they are not of high quality. The gears and crank are for beginners who want to climb steep hills and travel terrains at high speeds. The Vilano Shadow 2.0 is an inexpensive road bike for beginners. The company has been in existence since 2008. Shimano and Prowheel provide the parts for this bike. The double-butted aluminum frame offers rugged, internal cable routing, and lightweight dependability. The bike uses Dual-pivot alloy caliper brakes that will not shake and warp. It does not lose control when I want to stop. The tapered brake pads squeeze the rims, so the stop does not jar or bump. The shifter is from Shimano and comes with an integrated brake lever for control in braking, cranking, or shifting. The rims are 700cc double-walled CNC. The alloy machine sides offer a super smooth surface to help in aerodynamics and braking. The tires are CST 700c x 25c and are for gravel and road. I do not use them for mountain biking, downhill, or trials. The narrow tires allow me to maintain crank while pulling out of an incline. They do not sacrifice speed while I lean into corners. Because of its steel aluminum frame, the bike’s weight is not a hindrance when I climb hills. Also, I find it easy to lift it to my car’s rack. I discovered that I could go at 17mph with this bike. It may not be fast for some people, but it works well for me. What I like about the Vilano Shadow 2.0 is that I can depend on its components. I know it does not use the best parts available on the market, but I am confident in using it on the road. The breaks are precise because it uses the Shimano STI integrated brake lever. The drop handles help me in maintaining control and speed when I am on the road. You need a bike pump with a gauge because you need to pump the tires to a maximum of 110. Anything less or more than this number will cause flat tires. Also, you need a wrench to assemble the bike. Once you assembled it, you must bring it to a bike shop for inspection and tune-up. You may not like the seat because it is not comfortable for long rides. Thus, you can replace it with a better alternative. I replaced the pedals because they are of low quality. If I am to use it for road riding, they must be durable. I also bought cycling gloves to lessen the vibration effect whenever I ride it on rough terrain. The Vilano Shadow 2.0 Road Bike provides excellent performance. It is also durable and inexpensive. You may need to improve on the other areas, but those changes are nothing major. If you are a new biker, you can have this as your first bike. As for speed, the best starter road bike offers 14 speeds. You can upgrade it once you gain more experience in biking. If you are a newbie with a tight budget, you can buy the Shadow 2.0, and then make a few replacements and adjustments for you to have a comfortable bike. The Denali Road Bike carries the name of GMC, a well-known brand of trucks. Thus, the guarantee of quality is the same as the other GMC products. The aluminum alloy bike frame offers strength and weight savings where needed. The Denali road bike has 21 speeds with a 7005 aluminum straight gauge frame. I can lift it to my bike rack whenever I travel. Also, I like the material because it is robust thanks to its aircraft-grade aluminum. The Promax caliper brakes and brake levers provide safety in all weather conditions. The bike also has a water bottle cage to keep my hydrated whenever I ride. As for the rims, these are Vitesse racing rims; thus, they are of the highest quality. They are excellent looking and flawless in performance. My ride is stable and smooth whenever I use this road bike. Aside from the rims, the textured tires provide a sense of balance. Riding the bike at top speeds is safe because the Vitesse rims offer stability. Also, the rubber tires deflect sharp edges of thorns, pebbles, and bricks. The gears, shifters, and derailleurs are from Shimano, so there is an assurance of quality. Each of these components ensures that I have a highly enjoyable experience. The 700c tires are high performance and can stand the most rigorous roads. I need not worry about flat tires whenever I tackle rough terrain. The bike fork is efficient in absorbing shock from uneven ground. It means that I do not have to fear about losing control of my bike whenever I am on the road. Also, I do not feel any awkward jerking or pain because the fork can make seamless adjustments. The grip shifters on the handlebar allow me to shift gears without taking my hands off it. The bike is easy to assemble. You need not be an expert to do it. Size / Frame Measurements X-Small / 41 cm Small / 48 cm Medium / 5 cm Large / 63.5 cm The bike weighs 29lbs and can take around 250lbs of weight. Like most inexpensive road bikes, the pedals and tires need replacement. Better tires can provide better performance. The Denali tires are conventional, so you will not have any difficulty in finding alternatives. I also replaced the seat because the original was very stiff and uncomfortable for me. Since you need to assemble this bike, you must prepare a Philips screwdriver, a flat head screwdriver, and an Allen wrench before you decide to buy one. The GMC Denali road bike is perfect for starters. Aside from its robust build, it is also affordable and serves as an excellent investment. If you buy this bike, you need to ensure that you bring it to a bike shop for checking and tune-up. You may make some mistakes while assembling it. Thus, bike shop personnel can correct them for you. 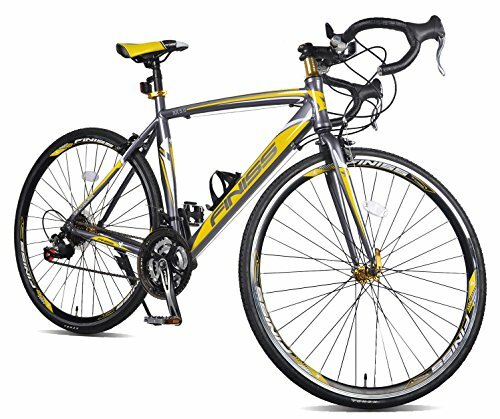 Since you are a beginner, you can choose to buy a GMC Denali road bike as you learn to tackle the various road conditions. 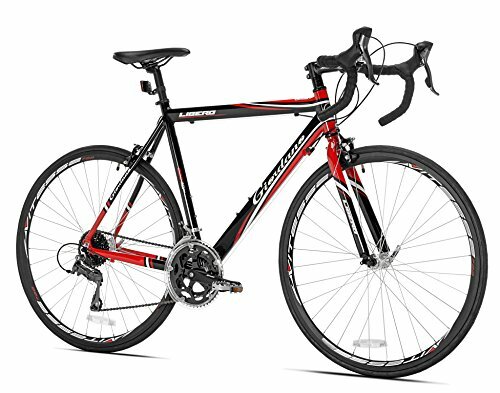 This best starter road bike is reliable and durable. It is perfect for use for many years. The 21-speed Merax Finiss Aluminum road bike weighs 28 lbs. 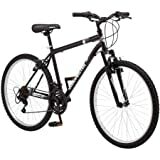 It is a perfect beginner bike for people who want to try biking but do not want to spend a hefty amount on it. Its lightweight and sturdy frame can carry people who weigh a maximum of 330 lbs. As a beginner bike, it is an excellent choice because you can use it for long distances. It is also sleek for casual rides within your neighborhood. It is lightweight and sturdy, and perfect either for the road or an aerodynamic ride. Its shifters and derailleurs are from Shimano. You get a smooth and easy gear shifting every time. This bike is sturdy, light, and aerodynamic because it is for road use. The Aluminum A5 rims and Kendra tires complement the frame’s sleek design. What I like about this bike is that the Shimano caliper brakes and gear make this bike excellent for racing without being too expensive. This Merax bike comes in different colors: yellow/gray, green/black, and red/white, and weighs 28 lbs. I like this ride because I can glide down the road effortlessly. Its aerodynamic design is perfect every time I want to maintain momentum. The Merax Finiss lessens vibrations and offers stability on the road. The derailleurs function efficiently with the Shimano shifters to enable fast and smooth gear changes. These features are excellent whenever I race on the streets. Of course, you cannot compare this bike’s features with the expensive models. The Merax Finiss is inexpensive, yet with excellent functionality. Its aesthetic is fantastic. Size / Measurement Small / 50 cm Medium / 54 cm Large / 58 cm You can adjust the seat to suit your requirements. Upon purchase, you have to be ready to assemble this bike. If you are a beginner, you can bring it to a professional for assembly and tune-up. Since this bike is for newbies, some of its parts are not up to par, but you can replace them as you go along. I do not feel comfortable about the seat, so I replaced it with the saddle that fits my needs. Also, the chain needs replacement because it is delicate and may break. This bike is an excellent entry-level bicycle. You can buy a new one as you become accustomed to the style and function of a road bike. Furthermore, as per the manufacturer, if you plan to use this bike for long-term, the weight limit is 220lbs although the advertised limit is 330 lbs. The Merax Finiss Aluminum 21 Speed 700c road bike is an excellent starter bicycle. It works well for its price, caliber, and quality. However, it has some low-quality components that you can replace. You can bring this bike to a professional for assembly and tune up so that it meets your requirements. The road bike will last a long time because it is durable. However, if you are over 220lbs, you may opt for another brand. You can remove the wheels and keep them if not in use. 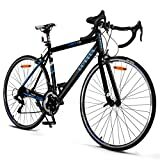 The bike is economical and works well as your best starter road bike.  Lightweight and Sturdy 6061 Aluminum Frame for smooth riding and easy transport.